What follows is some highlights of the Antelope history — we hope you enjoy. 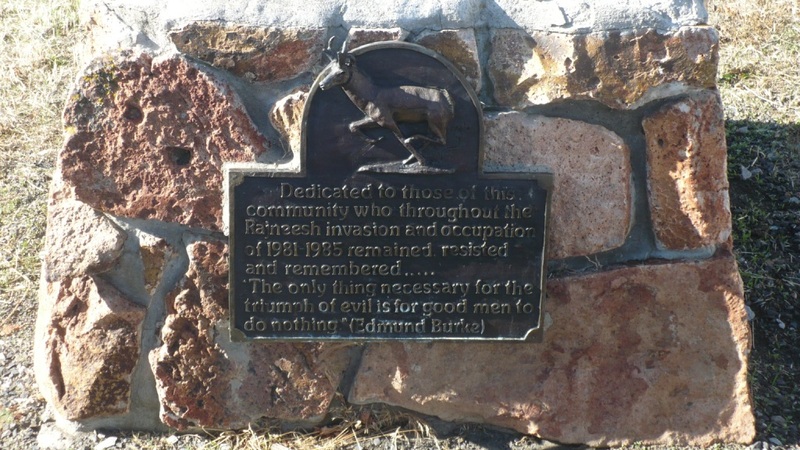 There is a plaque commemorating the community’s resistance against the Rajneesh, shown below (click the image for a full-sized view). There are other plaques memorializing the resistance around the state, most notably the one in front of the Wasco County Courthouse. This was a hard time for area residents and the memories are still strong and poignant. The City of Antelope was originally a stage and freight wagon road stop on the Old Dalles to Canyon City Trail. Howard Maupin came to Antelope in 1863 to operate a horse ranch, becoming the caretaker of the stage station which was established by Henry Wheeler in 1864. Maupin began raising cattle to provide meat for travelers. Nathan Wallace, who is sometimes credited with being Antelope’s first postmaster, acquired Antelope stage station from Maupin in 1870. Records indicate the community was considered to have been established in 1872. Antelope was incorporated in 1896 with John Hollinghead serving as first mayor. In 1897 the Community Church, as it is now known, was built. By 1898, with a population of 170, Antelope enjoyed three livery stables, one blacksmith shop, three mercantile stores, four hotels, one meat market, seven saloons, a church, drug store, barber shop, bowling alley, funeral parlor, post office, city hall, jail, and a community center called “Tammany Hall”. The city, on the old trail to the John Day country, offered a gay social life complete with formal dances, gaslights and boardwalks. Antelope became a center for cattlemen and, later, sheep men, expanding and enjoying considerable prosperity. The years 1870 thru 1910 were known as the era of the big sheep ranches, with sheepherders being imported from Spain, Australia, Ireland, and Scotland. In 1881, the town relocated two miles south of the original stage and wagon stop, when the stage route changed. The community experienced a boom in 1892, and a new school was built and a newspaper began publication. A raging fire in the summer of 1898 destroyed most of Antelope’s business district which was never to be entirely rebuilt. Damage was calculated to be $70,000 or more. Despite the losses, Antelope became a two newspaper city in 1900 when the newspaper met competition in the form of The Antelope Republican. Next, came the range war era bringing sheep losses attributed to or claimed by the Crook County Sheep Shooters Association to 10,000 in 1905. Shed and hay burning accompanied the slaughter of sheep. The declining sheep market and the extension of the Columbia Southern Railroad into Central Oregon, coupled with the disastrous fire, were responsible for Antelope’s decline since the 1898 haydays. 1917 was another significant year contributing to Antelope’s further decline with the decision to relocate U.S. Highway 97. Histories of this area abound, they have similar threads and stories but some emphasize one aspect over another. The Oregon Encyclopedia asserts that the little town of Antelope and the Muddy Ranch are “closely intertwined,” but such a statement leaves one with the impression that Antelope doesn’t have a real history of it’s own. Though many of the local ranches have had a close, generations-long relationship with the town, Antelope has always been it’s own community and is a functioning town which as of the 2000 census listed 59 residents – a figure which was somehow inflated as it has only around 39 permanent residents and a few vacation homeowners who visit from time to time. Interaction between local area ranchers and the town will undoubtedly remain close as it’s the only functioning community for many miles around. The city limits encompass about a square mile but the urban-growth boundary is much less. The current (2013) commercial focal point is the historic Antelope Cafe which is much busier during the summer months and fall hunting seasons than during the winter. When traveling Highway 97, which bisects Oregon in a north – south direction, visit Shaniko, a functioning “ghost town” & tourist-stop, then take the short 8-mile scenic detour south to Antelope. Stop at the Cafe and say “HI” to any locals you find there; we’d love to see you, too. Although many central Oregon communities have undergone rapid changes at times, none has been more profoundly affected by changing events than the tiny town of Antelope. It began as a sheep herding and ranching community on the supply route between The Dalles and the gold fields around Canyon City. The failure of the railroad to extend this far caused a near sudden death of the town’s growth. Years later, the invasion by the followers of the cult established by the Rajneesh literally pushed out every single resident, and resulted in a complete restructuring of the community including the permanent closing of the only functioning school in the area – a building now owned by the City and used as a multi-function Community Center, City Hall, and Fire Department training facility. View overlooking Antelope valley from the north, about 4 miles south of Shaniko. Established in the late nineteenth century by the Prineville Land and Livestock Company, with headquarters on Muddy Creek, the ranch in its heyday in the early 1900s supported large herds of sheep and cattle. Each year, ranch hands trailed the herds to summer range the ranch owned on Summit Prairie in the Ochocos; the herds then wintered-over on the Muddy. When the Summit Prairie range was sold in the 1950s, the Muddy’s livestock operation diminished, as the always-sparse forage on the home ranch was quickly over-grazed. Joseph Sherar apparently named Muddy Creek in 1862 when he was packing supplies to the John Day mines. He must have come upon the creek during spring runoff or after a cloudburst; ordinarily its flow is minimal, and in summer it often seems to dry up during the day, only to resume flowing at night. One reason many people associate the Muddy Ranch with Antelope is because of the 1981-1985 invasion of the area by the Rajneeshees, a quasi-religious (self-styled) community established by the Bhagwan Shree Rajneesh and his cult, who purchased the ranch for $5.75 million in 1981. (It was never “The Big Muddy” to locals; the redundant adjective seems to have entered popular usage with the Rajneeshees). They established a large commune on the Muddy’s 64,000 acres and began a systematic effort to take over the local government, beginning with the town of Antelope. By 1984 the cultists had, through coercion, bribery, and some outright threats, taken over the town, driving out most of the original residents. On Sept. 18, 1984, by a vote of 57 to 22, the charter was amended to change the name from Antelope to Rajneesh. This received considerable publicity throughout the state because feelings about the Bhagwan and his followers were sharply divided. The Bhagwan, as he was popularly known, was born Mohan Chandra Rajneesh on Dec. 11, 1931, in Kuchwada, India. After a career of study and teaching, he founded a cult in India and in 1981 moved, with a number of followers to Montclair, New Jersey. When the facilities there were not to his liking, he purchased the 64,000 acre Muddy Ranch near the John Day river, where his followers immediately began constructing the large commune; it was incorporated in 1982 as Rajneeshpuram. Friction developed at once between the red-clad disciples and Wasco County residents. In 1983, Oregon Attorney General David Frohnmeyer filed suit to invalidate the city. Meanwhile, the commune had grown to over 4000 people and expanded to take over the town of Antelope – the cult took over everything – Antelope, the town council, store, school, all but the post office by simply moving into town and out-voting the fifty or so natives. The town was renamed Rajneesh; the store/cafe became: Zorba the Buddha. Most of the non-Rajneesh residents left as a result of these pressures. In an effort to garner sympathy for their heavy-handed control of the town, in 1983, the “Rajneesh Times” newspaper headlined threats made against the only non-Rajneesh member of the Antelope City Council, John Silvertooth-Stewart. The reported threats were made, according to John Silvertooth-Stewart, because of his perceived cooperation with the cultists who by then completely controlled the City Council. In 1984, members of the commune introduced Salmonella organisms into salad bars at restaurants in The Dalles and 750 people were taken sick. In October of that year, busloads of homeless people were brought to the commune from various parts of the United States and registered to vote, apparently in an attempt to take over the county government. This was thwarted and subsequent investigation brought matters to a head in 1985. On Sept. 13, 1985, Anand Sheela, the Bhagwan’s general factotum, resigned and fled to Germany where she was later arrested on a variety of charges ranging from theft to attempted murder. The Bhagwan was also being pursued by the U.S. Immigration authorities and on Oct. 27, 1985, while attempting to flee, was intercepted at Charlotte, North Carolina on his way to Bermuda. In due course he was deported to India where he settled on his original commune at Pune, where he died on Jan. 19, 1990. In 1988, Connecticut General Life Insurance Company, the mortgage holder, filed to repossess the ranch property and title passed to them in 1989. For more information on this bizarre bit of Oregon history, see an Oregonian series of articles in July 1985 and the Oregonian, Jan. 20, 1990, pp. A1, 16 and 17. On Nov. 6, 1985, the remaining residents, both original and Rajneeshee, voted 34 to 0 to restore the original name. The Post Office Department, relying on the efficiency of Zip Code, 97001, had never changed the name from Antelope. Howard Maupin established the town of Antelope in 1863, (he died in 1887) and the town of Maupin, about 35 miles to the north, is named in his honor. Antelope was initially about one and a half miles northeast of the present town, as a stage station on The Dalles-Canyon City Road. When the road was re- routed in 1881, the town moved along with it, and today lies along Hwy 218, which is its official MAIN ST. Antelope grew rapidly as the traffic of freight wagons carrying wool out of the region increased, in and around 1900, when homesteaders arrived. By 1911, the town’s brief boom began to decline with the coming of railroads to central Oregon and the decline of sheep raising. The City of Maupin bears the name of one of the most celebrated of Oregon pioneers. Beside being applied to the post office, the name is also used for several geographic features in the central part of the state including two Maupin Buttes. Howard Maupin was born in Clay Co., Kentucky in 1815, and when he was about 15 years old moved to Missouri. He came to Oregon in 1863 and after spending a short time in the Willamette Valley, went to central Oregon. He first settled in Antelope Valley. Maupin established a stopping place for travelers and in 1871 was the first postmaster of the town of Antelope. Maupin also lived and operated at other points in central Oregon. He had a farm at the forks of Trout Creek and it was near that location that Paulina (see below) stole more of his stock. Maupin was a veteran of the Mexican War and was said to be a crack shot. Later he had a ferry on Deschutes River near the mouth of Bakeoven Creek, which was subsequently owned by W.E. Hunt. The place was then called Hunts Ferry. W.H. Staats bought the townsite when the railroads were built up Deschutes Canyon and named the place Maupin Ferry, but the postal authorities cut off the last word and since about 1909 the place has been called Maupin. – Source: Oregon Geographic Names, Sixth Edition, 1992, Lewis L. McArthur, Oregon Historical Society Press, ISBN O-87595-237-2. As a boy in 1906-1908, Pulitzer Prize-winning novelist H.L. Davis worked as a typesetter for the Antelope Herald, and his impressions of freighters, horse-traders, Indians, and improvident homesteaders passing through town figure vividly in his novel Honey in the Horn and in several of his essays. Another notable (and life-long) Antelope resident was John Silvertooth, who in addition to running his “Idle Hours” saloon, was variously mayor, barber, justice of the peace, and town clerk from the 1920s to the 1970s. The killing of the renegade Chief Paulina by Howard Maupin and James N. Clark put an and to most of The Dalles to Canyon City Stage station and stage stock robberies and taught the Indians “to leave the property of the white men’s stages alone or he would trail them down and shoot to kill with his high power rifles.” The elimination of Chief Paulina and his followers made the country more safe for settlement, between The Dalles and Canyon City and for that reason we classify Howard Maupin and James N. Clark among the most outstanding men in the 100 years of Wasco county history; and Henry H. Wheeler is given the same classification because he pioneered stage and freight service by wagons also helping to settle the country. The Dalles to Canyon City stage line service produced 3 of the most outstanding men in our history, a very remarkable record for one business or organization. Howard Maupin died at Ashwood, Oregon Jan. 4, 1887 and is buried not far from the grave of the Indian Chief Paulina. Henry Wheeler is buried at Mitchell where he engaged in the stock raising business until his retirement in 1904. Mr. Wheeler used the “Lever coaches” rather than the famous Concords which were used later. He left the Umatilla House, as stated above, on his first trips every Monday and Wednesdays. Later the service became daily and Wells Fargo gold stage coaches were put on the run, which hauled nothing but gold and the one or more guards besides the driver. These were the fast stages and some drivers preferred them in place of passenger, mail and express stages, for they only stopped long enough to change horses, grab a bite to eat and were off again in a cloud of dust or a splatter of mud. The winter time stations were Pratt’s 12 mile house (Wasco above Boyd); Nansene, up Long Hollow; Sherar’s Bridge on the Deschutes; Bakeoven; Howard Maupin’s at Antelope; James N. Clark’s Burnt Ranch stage stop on the John Day; Mitchell; Mountain on Murder’s Creek; Dayville and Canyon City. There were ordinarily 8 changes of horses during good weather but weather, Indians, road conditions all made alternate stage stops as conditions varied. From The Dalles to Bakeoven was the first days run. The second day was to Mitchell and the third day to Canyon City but even this schedule varied. S.L. Brooks was agent in The Dalles in 1867 with headquarters at the Umatilla House. Mr. Wheeler’s first mail contract was for $12,000 a year. He sold to Ad Edgar in 1868, retiring to his stock farm at Mitchell. In 1864 Edgar Jones operated a stage and express line over this same route to Canyon City but it was a slower service and merged later into a freight line. Chief Paulina and other headmen of the HunipuitÃ¶ka Paiute agreed to sign a treaty in the spring of 1865 after U.S. Army forces captured a group of Paiute hostages in the fall of 1864. Paulina’s wife and son were among those captured. Despite the treaty ceeding their lands in the Blue Mountains, Paulina and his band left the Klamath Reservation in April 1866 as they considered the treaty unfair. One year later, he was killed during a retaliatory attack by early Antelope settler Howard Maupin who headed a posse which left from the Antelope Stage Stop. Paulina’s last engagement took place at a cove later named Paulina Basin, located in northeastern Jefferson County. Maupin scalped Paulina and first paraded the scalp in the streets of the Dalles and Canyon City and then brought his scalp back to his Antelope homestead and nailed the scalp to his barn as a trophy. When his band heard of this the medicine men came to the old city one evening and cursed Maupin and his land forever. I swear before God to tell this story true just as it happened to us boys Percy Davis and Willie Silvertooth. It started snowing this morning when we went to school. Old Uncle Amos took sick last night and us boys had to start the stoves and lamps. Some of the older boys were there and Ben Taylor swore he had been out by the old town grave yard on his horse and saw Chief Paulina's ghost and that we should go tonight and get a look. My Father told me not to go and told Ben Taylor to quit scaring us. Willie and I we were not scared. At recess we decided we would go right after dark and see for ourself. Chattie Silvertooth and Gertie Hastings heard us so they can tell you that it is true. It was snowing awful hard but we set out to go about 6 O'ClockÂ from in back of the Silvertooth's saloon on a couple of ponies that belonged to some sheep herders who had been drunk on whiskey since Wednesday. Willie went to see his Father who was not there because he was up at Shaniko but Sim Browder saw us and he could tell you it is true as we told him we were head to see Chief Paulina's ghost. We reckoned Ben Taylor may be playing a trick on us so instead of going out the road we went down to the creek and up behind Lilac Hill. Up in the hills some pack of coyotes were howling and screeching like they had a fresh kill. It spooked the ponies real bad and they took off at a full gallop and Willie's tried to buck him off. The ponies took us for a mile or so along the creek. It was still snowing right badly and us boys had lost our true bearings being taken from our route. We thought we was at Maupin's homestead but we could not swear to that part. The ponies both came to a dead stop and were spooked. Then a light across the creek came towards us and we could see it was a glowing silver Apaloosa Indian pony. Then it came right besides us and we knew then in was a ghost one of the ponies from Paulina's tribe. She looked at us and said she was protecting good life in the canyon and that we were too young to go into that place and we should get on the road and ride back to town before we were killed by the curse Paulina's medicine men put on the Maupin place. The ponies followed him to the road and he sent them at a gallup towards the lights of town. We got back to the saloon and tied the ponies up at the water trough. We peeked through the back door and saw on the clock it was after 11 O'clock. We did not see how we were gone that long. We saw Sim Browder again and he can swear to it we told him the whole story and he accused us of stealing whiskey and getting drunk we were so crazy. I came home my brother pulled me in the window and I am now writing this accounting of this story and my brother said he would ask old man Luddeman to print this in the paper. We saw the ghost of the old Indian pony and we know Chief Paulina's ghost must be true. In the years following the Civil War, large, open tracts of land became available to Euro-Americans as the federal government progressively instituted the long-standing policy of Indian removal, whereby Native groups were forcibly re-settled onto reservations. As a result, sheep raising on the open range expanded throughout the American West, including Central Oregon. Central Oregon was a choice area for sheep raising. Sheepmen would graze their animals on the slopes of the Cascades and Ochoco Mountains during the spring and summer, moving the bands to the lower elevations during the cold winter months. In addition, the sheep proved particularly adapted to the changing plant life of the Central Oregon range. Sheep preferred the annual non-native “weeds” (or forbs) such as pigweed and quack grass that took root after cattle had grazed on native species such as bunchgrass and giant wild rye. Routine, isolation, and an attention to detail – especially the health of the sheep – marked the lives of the sheepherders on the open range. Also known as tramp sheepmen, these sheepherders were not always well-liked by either farmers or cattlemen. This stemmed from a general view of sheep-herding as a less reputable occupation than farming or stock raising and from growing conflicts over land use and natural resources. Despite these difficulties, young immigrant men, particularly those from countries with sheep-herding traditions, sought out these positions, which provided opportunities for economic advancement. Upon receiving their annual pay, sheepherders might purchase their own small flocks in order to become independent operators. Dedication of Oregon History memorial in Antelope celebrating Antelope’s role opening up Eastern Oregon as transportation hub along the Dalles Military Road and earlier as miners moved in John Day Baker area gold fields.